We are married! We have been for about 2 months now. Our wedding was absolutely perfect, although the weeks leading up to it were fairly tumultuous. Here's a quickand choppy look at our summer mixed with a dab of reflection. I promise to provide further details soon. Friday before the wedding was filled with trips to the airport to pick up family members flying in from all over the country. We also tackled the rehearsal for the ring ceremony; a gigantic barbeque, which served as our rehearsal dinner; and an unplanned combined bachelor/bachelorette party. The following day I woke up at 5:00 Saturday morning to get ready for early morning pictures. This consisted of me sitting and staring into space/writing my vows for the ring ceremony while my hair stylist and make up artist simultaneously worked their magic. Afterwards, I rushed to my pictures and was finally sealed to Ben at 10:30 am. 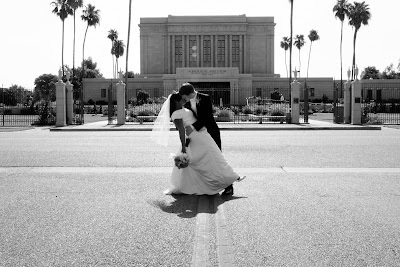 Being sealed was such a relief: total and complete happiness washed over me as I left the temple. It was a beautiful day. Ben and I went to Bahama Bucks afterwards in our full wedding attire( I really wanted a Caribbean cola one last time before I returned to Chicago). The luncheon, ring ceremony, and reception were all wonderful. I can't imagine a better day. Previous to actually getting married I couldn't wait for the day after my wedding when there would be no stress or obligations. Thankfully, when our wedding day did arrive I enjoyed it so much that I didn't want the day to end. tiny room, especially after staying a few days in the king suite at the Hilton. Fortunately, we recovered from our initial claustrophobic musings and grew to enjoy the swaddling of our close quarters. We went Kayaking, snorkeling, and hiking, which was pretty fun, although Ben did get a 2nd degree sunburn on his foot. When we returned to our apartment, we were greeted with a number of unfortunate events. The first being that Ben's temporary job position had been permanently filled. The second was an eviction notice taped to our door. The eviction notice was a mistake but still caused a surge of panic as the unforgiving hand of reality caught us in its grasp. We awoke early the next day (Saturday) to prepare for our Chicago open house. We had to run all over Chicago to pull off the event, but it was lovely in the end. My mom and grandparents came to show their support but ended up staying longer than they planned. They were unable to fly back to AZ until 3 days after their original flight date. This, of course, caused plenty of stress for my mother, but we were able to semi smooth this inconvenience over with multiple deliveries of Chicago's famous Giordano's Pizza and several movies. It was nice to have her stay for a little while extra, even if it was under unplanned and inconvenient circumstances. My mom helped Ben and me start to organize our hazard area aka our apartment.It was nice to have someone to help us breakdown the heaping mess and put it all in perspective. The next few weeks were filled with the excruciating pain that accompanies the job hunt. Success in this area proved to be a little less than impossible given the current job market and our late summer search. After about a month, we both received a job offer but our individual offers conflicted with the each other's. We decided that Ben would accept his offer, and I would continue to look on the part time front. Unfortunately, that proved equally hard given that I could only commit for a little over a month. In the end, I gave into the unemployment that was fated for me and followed my neurologist's orders by not working for the summer. Don't worry, I have been keeping busy. There have been a number of pressing matters to take care of since our marriage, not the least of which is the constant organizing of our apartment. Like our marriage, organizing the apartment seems to be an eternal commitment. There were also a lot of technical things to take care. No one ever mentions the billions of things that need to be taken care of immediately after getting married. Of course, this may be to lure unsuspecting happily engaged couples into actually taking the step to marriage. I know if I had to think about all of the things that needed be done previous to actually getting back and doing them, I would not have enjoyed the honeymoon at all. On the other hand, that sort of knowledge could have helped us not to run full pace into the wall of reality. Instead, we could have lightly skipped hand in hand into that very wall. I have finally started feeling a bit more productive as I have started to check off many of the tasks I had to complete before the end summer. I do have a class I need to finish from last year that I hope to work towards completing this coming week. Here in Chicago, we are starting to see the first hints of Autumn (this happens to be Ben and my favorite season). Leaves are starting to show signs of their age, and the weather is cooling down. The forecast promises rain and nice weather for the next few days. School will be starting in about two weeks, which is both terrifying and exciting. I don't want to start my last year of college; I have too much to do, but I am looking forward to having Ben home more and us enjoying a normal schedule. As the summer comes to an end, I can't help but wonder where this school year will take us. I'm not sure that Ben or I started last school year with the expectation that we would or could be married by the end of summer. Where will I be next year? Correction: where will we be, not just in the physical but in the marital emotional sense? Every wonderful moment of the Chicago summer as well as its subtle yet startling transformation into autumn has me wondering if I will be here to experience these moments next year or am I blindly experiencing my last Chicago summer moments without my even realizing? I look forward to becoming a more dedicated blogger, although I am sure said level of dedication will wax and wane depending on the mass of homework that governs every U of C student's life. nicely done, Natasha. HOpe you guys are enjoying getting back to school & having each other there for support. Take care! I remember how crazy it was getting everything together when we first got married. For example, the gas wasn't turned on ... we went on our honeymoon and came back when school started only to find we still had COLD WATER!! I hope things are coming together well for you guys!